Giant hogweed can cause severe burns and is a threat to anglers in particular. A dangerous invasive plant that causes painful blisters and permanent scarring is thriving in Irish gardens and riverbanks around the country, according to an Irish botanist. 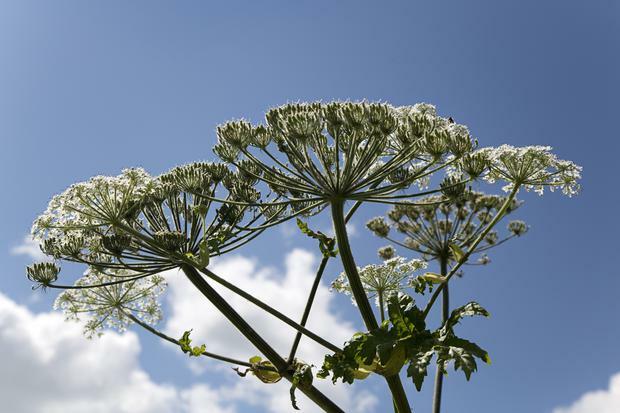 The occurrence of Giant Hogweed throughout the country is on the increase and poses a significant threat to the public should they come in contact with the plant’s sap. “To say they are dangerous isn’t an understatement,” said Dr. Daniel Kelly, a retired professor of botany at Trinity College Dublin. “The sap of Giant Hogweed sensitises skin to light, can cause painful blisters and the symptoms can recur for years and leave scarring. “Giant hogweed is usually found on river banks and is particularly a threat to anglers,” he said. The botanist revealed that although Giant Hogweed mostly thrives on riverbanks, he has spotted it in suburban gardens which he said is a big risk to children who come into contact with the plant. “[Hogweed] can be found anywhere. I recently spotted it in a garden on Dublin’s South Circular Road. Now the garden was a little bit neglected but the plant was thriving. “I have written to the owners about it because people don’t really know the danger this plant’s sap can cause,” said Dr. Kelly. The dangerous plant has made headlines in the UK in recent weeks after ten-year-old Laura Fuller suffered third degree burns all over her arms and face after coming in contact with the species in Bristol. Giant Hogweed should not be confused with our native species of Hogweed which is not a threat to humans. Giant Hogweed can be identified by its size (often more than 5 metres tall), its dark toothy leaves and its white flowers, produced in umbrella-like clusters. Dr Kelly stressed that if this plant is identified in your garden it should be killed and if it is too large professional help should be sought. “The occurrence of hogweed is on the increase and it’s spreading. I’ve heard of a case in Bray involving a young child coming into contact with the plant but I’m not sure what came of it in the end. “These plants can grow up to five metres tall and wide and are very well established. “Coming in contact with the sap can be bad news. It can cause blisters. It’s also a threat to anyone who maybe trimming hedges or ditches if the sap happened to splash into the eyes. “If you see this plant growing in your garden my advice would be to buy a glyphosate spray and kill it. If it’s a big problem or a big plant it would be worth calling in the professionals,” he said. If contact has been made with the plant, the area should immediately be washed with soap and cold water and covered up from sunlight for 48 hours. If it has caused a reaction medical help should be sought immediately.